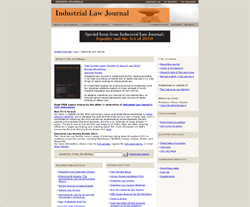 Industrial Law Journal is established as the leading periodical in its field, providing comment and in-depth analysis on a wide range of topics relating to employment law. It is essential reading for practising lawyers, academics, and lay industrial relations experts to keep abreast of newly enacted legislation and proposals for law reform. In additionIndustrial Law Journal carries commentary on relevant government publications and reviews of books relating to labour law. PDFs and Abstracts from the current issue can be located here. PDFs and Abstracts from previous issues are available here. Please visit this page for the most current information. General enquiries should be addressed to the editor, Professor Simon Deakin. Articles, notes and reviews for consideration should be sent to the relevant subsection editor. Please see below for a list of the editors and their contact details. The journal welcomes submissions for all these sections. Submission by email is preferred. Manuscripts submitted electronically should be sent in MS Word format. Articles must be accompanied by an abstract of up to 200 words. Text should be A4, double-spaced with numbered pages. Each new paragraph should be indented using the indent key except for the first paragraph under a heading. Final versions of articles should be in the style of OSCOLA 2006. However, preliminary submissions need not be in this format. Section submissions should follow the relevant section for style. Please refer to a recent issue of the journal. Articles should not generally exceed 12,000 words, commentaries 6,000 words, and case notes and legislation notes 5,000 words, in each case inclusive of footnotes. If more specific guidance is needed on the above matters, please contact the relevant section editor. All submissions must contain full contact details (email, postal, telephone, fax) of the corresponding author with institutional affiliations for all contributors. Please note that by submitting an article for publication you confirm that you are the corresponding/submitting author and that Oxford University Press (“OUP”) may retain your email address for the purpose of communicating with you about the article. You agree to notify OUP immediately if your details change. If your article is accepted for publication OUP will contact you using the email address you have used in the submission process. Please note that OUP does not retain copies of rejected articles. For information about this journal’s policy, please visit our Author Self-Archiving policy page.